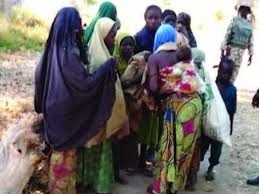 Troops of the Nigerian Army attached to the Operation Lafiya Dole encountered Boko Haram insurgents in the Ngoshe area of Borno State, during which 16 women and children were rescued from captivity. Our correspondent learnt that the troops of the 82 Division, Task Force Battalion, Ngoshe, in conjunction with members of the Civilian Joint Task Force, conducted the clearance operation to the Agapaluwa area of Ngoshe, where the captives, made up of six women and 10 children, were sighted. According to the army, the troops shot dead two of the terrorists during a gun battle, while others fled with gunshot injuries. Our correspondent gathered that the rescued women and children were taken for screening and profiling at an undisclosed location. The Nigerian Army confirmed the rescue on its Twitter handle on Tuesday. It also announced that stolen food items discovered in the terrorists’ hideout were set on fire. The army tweeted, “In continuation of efforts to finally clear the remnants of the Boko Haram terrorists in the North-East, troops of the 82 Division, Task Force Battalion, Ngoshe, in conjunction with members of the Civilian Joint Task Force, conducted a clearance operation to Agapaluwa in Borno State.